Well it’s still cold and we’ve had more snow, so I thought some further gaming on the winter terrain was appropriate. I also recently re-read The Eagle in the Snow by Wallace Breem, so out came some Late Romans and their Goth enemies and over the weekend I played a few solo games using the excellent Lion Rampant rules. I wanted to try some of the scenarios I hadn’t played before, so picked two 24 point forces and had a few goes of ‘Hammer and Anvil’, and one of ‘The Messenger’. Both require the forces to move a lot to achieve their objectives, which is always a challenge with the unpredictable activation rules in the Rampant series! My house rule is that all leaders have the Commanding trait to gain a re-roll on the first failed activation roll each turn (if the unit is within 12″). This suits me better, but a good plan can still be ruined when things don’t happen for you. The figures are 15mm and I played at half-scale (ie. 2″ in the rules being 1″ on the table). It worked well on a 4’x3′. The Hammer and Anvil games proved very tough to win for the side trying to exit the opposite table edge, but I did manage it once out of 3 attempts. I swapped the forces around to give each side a chance to attack and defend. The Goths managed to get the Messenger through in the last game I played, having had a rough time of it initially. All the games proved exciting, with some challenging decisions (even playing solo) and lots of incidents. I may just have to play a few more now! On Saturday four of us (Goat major, Essex Boy, Count Belisarius and I) played a big 15mm Punic Wars game at Wargames Foundry’s premises near Newark. We chose the Punic period because 3 of us had suitable figures (most of which hadn’t seen the light for day for a lot of years), and To the Strongest because it offered a relatively quick-play experience and, being grid-based, wasn’t going to be fazed by mild variations in people’s unit basing. We collated a list of available figures and drew up two armies, each about 550 points in game terms. As a first go with the rules (apart from a solo test game I played a while back) this was rather ambitious, but we wanted a bit of a spectacle and the look and feel of a big battle. Hopefully the pictures give the impression that we achieved this. You do need quite a few bits and pieces to play TtS – playing cards, activation markers, ammo markers, as well as a gridded battlefield. We chatted through all this beforehand and were able to turn up with the right items on the day. We used two 6’x4′ Mat-o-War cloths, foliage clumps placed at 6″ intervals, and some other scenery, then deployed the armies and got stuck in. Inevitably we were playing more slowly at the beginning than we were by the end, but we soon got the gist of things and enjoyed the way the rules worked. EB and I drew the Carthaginians, with their various Spanish, Numidian and Italian allies (plus some elephants of course). GM and CB each had two Roman legions, plus hordes of Gauls and other allies. Naturally everyone advanced and got stuck in, infantry in the middle and cavalry on the flanks. 4 or 5 hours of play later we hadn’t quite got a decisive result, but we had had a lot of fun. Elephants had rampaged back through friendly troops, generals had died and hat-tricks of aces had been drawn (an unlikely occurrence but repeated several times – mostly by the unlucky GM). By the time we had to stop and pack up I had a slight positional edge over GM’s Romans/Gauls, and hadn’t committed many of my doughty African Spearmen, while to my left EB and CB had fought out a fairly bloody draw. A close thing all-round then, and a very enjoyable day. Great company as always and the game was played in a friendly spirit all-round. We had a good night out in Newark too, with a few ales and an excellent curry. There are some tentative plans for games next year, which will hopefully happen. It’ll probably be mine and Simon’s turn to travel, if EB and the Count can get their gaming spaces sorted! That was after a visit to Hammerhead on the Saturday, which was worth popping along to. It’s good to see the enthusiasm of the participation games at this show, the venue is pretty good and there are plenty of traders too. I didn’t buy much but it was nice to wander about and bump into some friends – Purps, GM and Gary, for a catch up. I missed a ‘hi’ to Henry as he was embroiled in hosting his 18th century paintballing game! Since then I’ve been investigating the To the Strongest rules from BigRedBat, and very interesting they are too. 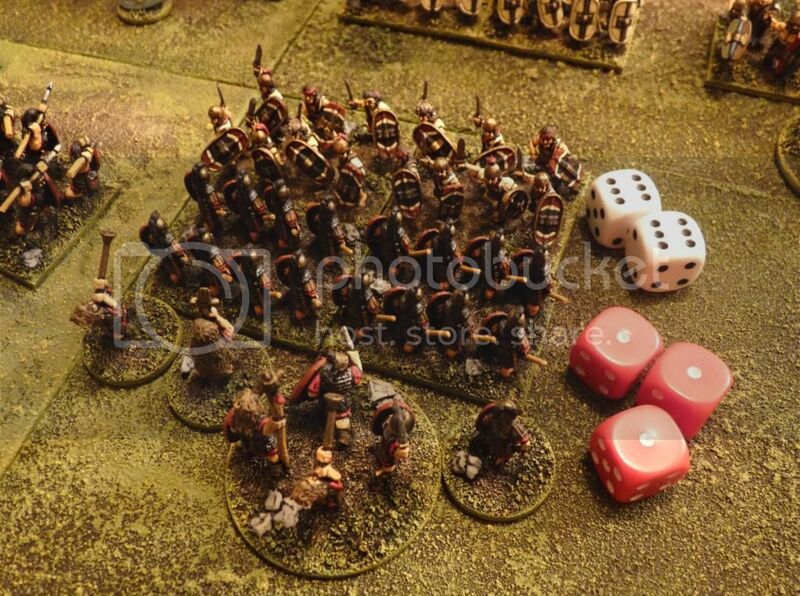 There are plans afoot for a 4 player get-together later this year for some 15mm ancients gaming – specifically the Punic Wars, and we’ve decided on (not without some debate!) using these rules for their benefits of grids for movement, ease of learning, and flexibility in terms of figure basing. Quick pic here, and I’ll follow with some observations on my initial playtesting in the next post. I’m happily lacking any hobby deadlines at the moment, so have been dabbling with whatever takes my fancy (ie. whatever is already prep’d and undercoated). A unit of 6mm Grenzers for my Seven Years War Austrians, which I might finally make a proper start on soon. Heroics and Ros figures. The first 3 Austrian battalions for my 6mm 1859 army, H&R again. Two of these units need flags, which I’ll be making from pin and foil – so I can scrunch them up and not have to paint perfect double-headed eagles, etc! I’ve tried the Baccus ones and, for me, they suffer from being printed – the symbols are a bit pixelated and they’re faded rather than full of colour. Who knows what I’ll do next, more soon. I’ve only heard good things about these rules from Dan Mersey/Osprey and have decided to have a go with them. I bought them when they came out and was impressed by the clarity of the writing and many of the basic concepts behind the rules. I didn’t have a clear idea of how/when I would get into gaming with this ruleset but then along came an idea among the LAW forum and Ayton crowd to plan for a multi-player Lion Rampant weekend in 2017, and I started to think about a 28mm force (or 2 opposed retinues, you know how it is..). Now, 2017 is a long way off (the 2016 game being already planned), but as is to be expected with wargamers, excitement has already built up to a point where a late 2015 get-together is being discussed. I’d better get cracking then! A friend has been working on a 15mm Medieval project and kindly sent me a QRS he’s written, which incorporates some post-publication clarifications, and a unit/troop type roster. With the table still set up from the Sambre game I decided it would be silly not to have a go, so removed a few terrain boards from one edge and swapped out the Roman fort for a couple of thatched cottages and some scattered scenery. 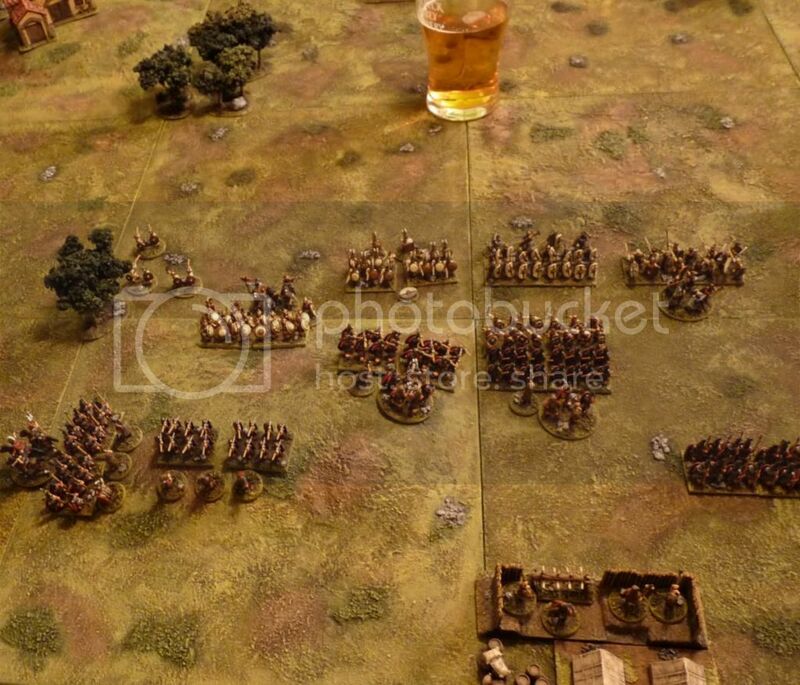 I’d be playing the game in 15mm, with all distances halved. This meant a board of 3 feet by 2-and-a-bit feet would be fine for a game that recommends 6’x4′ for 28mm. For figures I raided some fantasy and Dark Ages forces to gather together a fairly traditional Feudal retinue to fight against a slightly less colourful, and more warband-like mob from the fringes of civilisation. The rules offer plenty of troop types and, on top of that, a number of equipment and upgrade options to customise things further. A sensible person would tackle a first game with smaller than standard forces and just a few unit types. That’s why I decided to go for full 24 point retinues and loads of variety. Well, I was in no hurry and would work through things over as much time as needed. Naturally the scenario for this first game was based on the standard encounter clash – called ‘Bloodbath’ in the book. Sounds like it should be about right. The cottages would inevitably offer a focal point to fight over, and the wooded hills would both channel the main forces towards each other, while offering cover and concealment to the rest. Here’s the table and (hopefully) pretty much everything I’d need to play the game. Next post: some pics from the game and thoughts on how things went. The first game ended in a Roman minor victory, with them scoring 15 victory points (14 being required for a win) against the Carthaginians, with the latter scoring 10 in return. With the terrain and figures already to hand it would have been rude not to play another game so I made a few minor changes to the table (ie. clearing a bit more central space) and re-deployed. This time I upped the armies by half again for a 150 point game involving a total of just over 500 figures. The Romans had now recruited a force of Spanish and the Carthaginians had bought in more Gauls and Numidians. On the assumption that the Carthaginians were coming back for more, and the Romans were happy to oblige (and confident from the first battle), I decided that both sides were ‘up for it’ and there was no defender as such. I didn’t take many pictures this time, but did capture the deployment and some of the early moves. This time the Romans were faced by a first line of seething Gauls who charged in hard as they always do. The elephants were in the Carthaginian second line, as were the best of their infantry. It worked; despite the Romans using their unique ‘Legion’ rule which allowed them to swap tired units in combat with fresh reserves, and cutting up most of the Gauls, the attrition was too heavy and their right and right-centre crumbled. Both sides were forced to commit generals to the melee, and several were lost. What’s Latin for ‘not this lot again!’? When the dust cleared the Carthaginians had got their revenge. Both Roman flanks were crushed and although they still had a reasonably viable second line still able to fight, the enemy had achieved a decent victory: 23-15 (first to score 21 being the winner in this bigger battle). I think the Romans would have been able to fall back on their camp, and march away during the night or the following day – the enemy were too hard hit themselves to prevent it. It was very enjoyable to return to this period, collection and rules. I hope not to leave it so long next time. The Romans are made up of Essex and Old Glory infantry, Essex cavalry and a right old mix for skirmishers, including some 10th Legion and (now defunct) Strategia e Tattica. The Carthaginians are even more of a mix – most are Corvus Belli, but there are some Lancashire, Essex and Old Glory in there too. They all go together well as far as I’m concerned, which makes picking what to buy a matter of preference rather than being restricted by size, etc. In the end I played two solo Rome vs Carthage games on Friday evening, finishing off on Saturday morning. The first was a 100 point game (100 points per army as per the rules I was using). I played it as a standard attack-defence game, having previously rolled to determine that the Carthaginians would be the attacker. The game set up gave the Romans a handy hill in their deploy area, and provided for a couple of woods towards the flanks. There would be plenty of open space in the middle for the infantry to come to grips, and just enough open ground to either flank for the Carthaginian cavalry advantage to be a factor. True to their mission, the Carthaginian army advanced, pushing cavalry ahead on the flanks and skirmishers into the woods to fight their Roman counterparts. The Romans used more velites in an attempt to delay the crunch of elephant on hastati, but couldn’t hold them up for long and soon the battle was in full flow as the front ranks crashed into each other. Gauls and Spanish charged the Roman wall and heavy cavalry closed in on the weaker Roman left. The fighting was tough everywhere, and the Roman cavalry in particular fought back tenaciously despite the odds. The elephants, having swept aside the velites (who did at least cause some casualties and disruption) got stuck into a unit of principes, pushing them back in disorder. A freak result for some of the Spanish against heavier Roman infantry! The battle lines surged back and fore and each side had their share of triumphs and disasters. After 8 game turns though, the Romans had dealt with the nellies and held on despite their vulnerable flanks, winning a close victory (15-10) and forcing the enemy to retire from the field. There would need to be a re-match, but in the meantime it was definitely beer o’clock..
One good game played, another slightly bigger one underway. Although I hadn’t intended to run a public referendum on what game to play on Friday evening, there’s been a landslide vote in favour of the Punic Wars in 15mm. Or rather Count Belisarius said he’d like to see it, so lacking a better reason to do something else, how can I refuse? Rome vs Carthage then, with the usual assortment of allies for the latter to keep the Romans on their toes. I’ll set up a standard sized game of 100 points per side, using my house rules (By Force of Arms, written by my friend Jase, and which have seen plenty of action over the years). I’ve already selected the armies, and a dice roll has determined that the Carthaginians are the ‘attacker’, meaning that for strategic reasons they need to get their skates on and win decisively before they run out of time. Good job they’ve got a cavalry advantage and, of course, some nellies to throw at the enemy!